How Could Indonesia Make Sure Subsidized Rice Was Really Getting To Poor People? : Goats and Soda Indonesia had a program to provide subsidized rice to the poor. But thousands of kilos didn't make it to the recipients. A laborer arranges sacks of rice at a market in Jakarta. Imagine if you had a rice delivery system that was supposed to deliver grain from point A, a government warehouse, to point B, homes of low-income residents. But for every 100 kilos of rice that left the warehouse less than 50 kilos were actually reaching people's kitchens. This was the situation in Indonesia for nearly two decades as the government tried to provide a nutritional safety net to the nation's poorest citizens. The program called Raskin, or Rice for the Poor, was set up in the wake of the Asian financial crisis of the late 1990s. 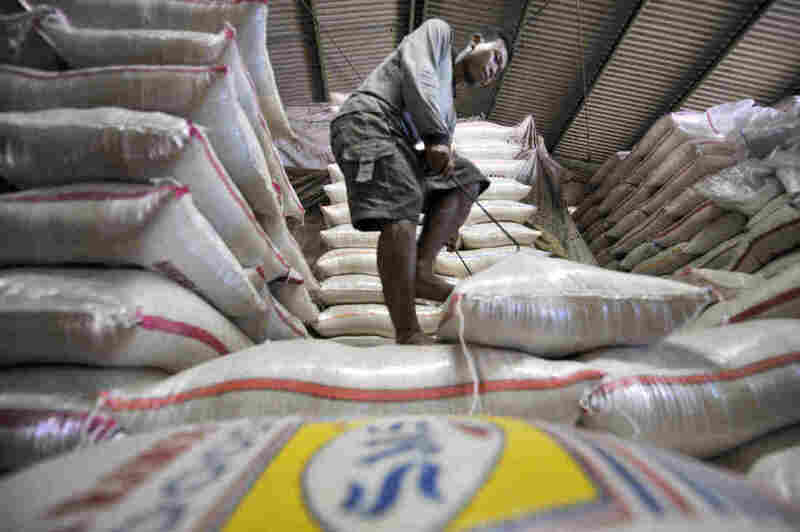 Its goal was to deliver subsidized rice each month to Indonesia's most vulnerable households. "It's an enormous program," says Abhijit Banerjee, an economist from the Massachusetts Institute of Technology who's studied the Raskin program for years. "Indonesia is one of the biggest countries in the world. And this is their largest social support program." With more than 250 million people Indonesia is the fourth most populous nation in the world after China, India and the United States. "If you're a person interested in poverty then this is one of the places where you want to be working," says Banerjee. And the Indonesian government recognized that Raskin desperately needed to be fixed. It was spending $1.5 billion a year on the program but less than half the rice was actually reaching the intended recipients. Here's how the program was supposed to work. The central government shipped the rice to thousands of distribution points across the chain of islands that makes up the Southeast Asian nation. Then officials at the village or neighborhood level were in charge of handing out the rice and collecting a meager subsidy. Low-income families are supposed to get 15 kilos of rice a month — about 33 pounds — at roughly 15 cents a kilo, about a fifth of the going price in the market. Many of the local officials, however, decided to distribute the rice to residents who weren't on the government's poverty rolls but who they felt were in need. Others decided to set the subsidy price themselves. This wiped out much of the intended benefit of Raskin, which was to provide a staple food at a rock bottom price for the country's poorest citizens. But it turned out that there was a really simple way to make the program far more efficient. "It's not rocket science," says Banerjee. "There's a certain tendency among both social scientists and policymakers to assume that the solution to a complex problem has to be complex, and I don't think that's always true." Banerjee and a group of colleagues in 2012 began to test possible ways to plug the leaks in the Raskin program. They found that the solution didn't lie in tinkering with controls at the warehouse or updating bureaucratic policies in Jakarta. The solution lay in giving recipients written proof of what they were entitled to under the program. Banerjee and his colleagues sent hundreds of thousands of postcards to the intended beneficiaries of Raskin in more than 500 villages. The cards stated explicitly that you, Joe or Jane Citizen, are eligible for this program, this is exactly how much rice you're supposed to get each month and this is how much you're supposed to pay. "The whole point is this changes your bargaining power," says Benjamin Olken, another economist from MIT who worked with Banerjee on ways to improve Raskin. So the village leaders no longer had a monopoly on information. It was much harder for them to arbitrarily decide who gets how much rice and at what price. Once villagers have an eligibility card with their name on it, they're in a much better position to demand their full ration. "It made a big difference," Olken says. "Just sending out the cards to a village led the eligible beneficiaries to receive 26 percent more rice than in the control villages." Out of 572 villages in the study, 378 were sent the cards. In these types of aid programs confusion and obfuscation are often the accomplices of corruption. And it's not enough to publish the rules of the program on a government website or a local newspaper -- as they were for Raskin. Banerjee says the people who were skimming off Raskin had an incentive to keep the program mired in mystery. Banerjee says many recipients didn't even know what that they were supposed to pay for their ration. "The price was something that was set for seven years. It was the same price," he says. "Yet many people didn't know the price." The MIT economists tested various methods of publicizing eligibility for Raskin. They found that the most effective intervention was to send personalized postcards to recipients and then also post flyers in the village declaring who was eligible. There's an economics term (it's also used in game theory) called "common knowledge." Olken says that's what they were trying to get to with Raskin. It's a social state where everyone knows the rules of the program and everyone knows that everyone else knows the rules. "[Recipients] can go to the village head and say, 'Look I know that I'm eligible. And I know that you know that I'm eligible.'" Olken says. "And so if the village head says, 'No, you only get five kilos.' You can say, 'No, no, I know my rights. And, look, it says it here on the paper what my rights are.'" Olken and Banerjee's analysis of the use of postcards to improve the efficiency of Raskin was published in the Journal of Political Economy. Meanwhile, Indonesia has taken their ideas on Raskin eligibility cards and expanded them to cover several other social programs, including a school subsidy and a temporary cash transfer program. The government in 2015 sent out a credit-card sized I.D. called Kartu Pelindungan Social or "Social Protection Card" to more than 15 million Indonesians, letting them and aid officials know what benefits they should be getting.